The theory that Galor and Ozak (2014) put forward has to do with agriculture. The general idea is that certain crops take longer to produce but they provide more calories. As a consequence, people who are willing to invest in those crops as opposed to crops that yield quickly are expected to be more patient. When these people see the returns to their investments, their belief (so to speak) in patience is reinforced and they transmit these values to their children. 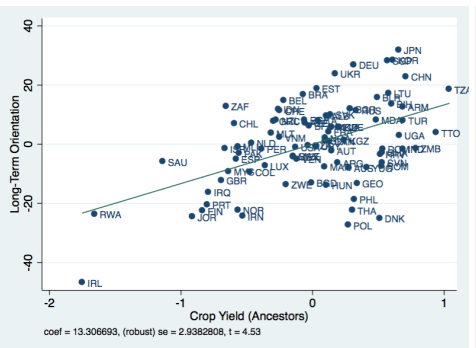 Thus if you have two identical countries one with higher yield crops and one lower yield crops, then you expect the first country’s inhabitants to be more patient. Of course this effect takes time to propagate through a whole country (at least centuries). So in essence we’re talking about how crop choice in around say 1500 affects the time preferences of different countries today. The point is that choosing a higher yield crop centuries ago may have made people in the region in question more patient because of the mechanism described above. And that we should be able to explain current differences in time preferences using this theory. How will one decide which “mode” (subsistence or investment) to choose? Of course, it all depends on how much one values the future relative to the present, i.e. it all depends on time preferences (patience). The authors can derive a threshold level of patience: if one is more patient than the threshold, one will be in investment mode, and vice versa. The threshold is decreasing in the returns to investment. I.e. the higher return to investment, the higher the second-period income, so even more impatient people are willing to wait for it now. Now, the idea is that individuals have children, and they transfer their time preferences to them. Subsistence mode individuals transfer their preferences unchanged, but investment mode individuals transfer more patience to their children than they had (i.e. their children will be more patient than they were). An intuition for this could be the reinforcement effect of patience: patient individuals see their investments pay off, so their decision to be patient is rewarded. Therefore, they value patience even more later in their lives (at the time they raise their kids), and they transfer this new value to their children. The level of patience investment mode people transfer to their children is not unbounded though. Above some point, they won’t transfer more to their children than their own level of patience. This is because there are diminishing returns to patience, simply because people care about present day consumption as well. So in the long run, investment mode individuals’ time preferences will converge to some fixed value (called a steady state value). A final point worth mentioning is that people value children for their quantity (i.e. they like more children). And they decide about the number of children in the second period of their working lives. But in that period investment mode individuals are richer, so they will have more kids. The result is that in the long run, the number of investment mode individuals will vastly exceed the number of subsistence individuals. So if this process started in around 1500, then by today the majority of people in all (developed) countries are investment mode individuals (or descendants thereof). So the time preferences we observe today are exactly the steady state preferences to which investment mode individuals converge, i.e. the time preferences that children of investment mode individuals inherit in the long run. So what do the data say about this theory? First, the authors check whether long-term orientation (i.e. patience) can be explained by crop yield. They use a very cool dataset, which has information on a lot of crops and their yields broken down by roughly 100 sq km areas on the whole planet. I.e. the yield of wheat may be good in Kansas but it’s probably zero in the Sahara. It is shown first of all that indeed crops with higher yield have a longer growth cycle (take more time to mature). This relationship is shown in the figure below. An issue might be that more long-term oriented people choose to cultivate crops with higher yields. To avoid this pitfall, the authors use what they call potential crop yield, i.e. that causality runs the other way than what’s predicted by the theory. This is the yield for a crop under low levels of inputs and rain-fed agriculture (as opposed to irrigation). This characterizes early agriculture well, and more importantly the low level inputs and no irrigation mean that these yields apply in the absence of much human intervention. Thus these yields are not the consequences of deliberate human decision-making (which could have been affected by long-term orientation already). Using this data, first the authors find in a sample of 87 countries that indeed crop yield is significantly positively associated with long-term orientation. The relationship between crop yield and long-term orientation is depicted in the figure below. The main message is that a one standard deviation increase in crop yield would lead to a 7.4 to 13.3 percentage point increase in long-term orientation. One problem could be that high yield crops only grow in certain geographical regions, and thus long-term oriented people moved there deliberately, while short-term oriented people remained in or moved to other areas. In this case, it would be not agriculture but geography that determines long-term orientation. To control for this, the authors take advantage of the Columbian Exchange, which refers to the appearance of new previously unknown crops all over the world around 1500. Since new crops spread across the world randomly (i.e. they did not only spread to areas with good geography), if the increase in potential crop yield due to these new crops also significantly predicts long-term orientation, then it is not geography that matters. This is indeed found to be the case. A third test of the theory looks at the long-term orientation of second-generation immigrants within a given country. The theory would predict that long-term orientation (LTO) is culturally transmitted. Since this is a within-country analysis, all people in the sample grew up in the same country, but they differ by their parents’ country of origin because they’re second-generation immigrants. If LTO is culturally transmitted, then the parents’ country of origin should help predict the individual’s LTO. This is indeed found to be the case: the LTO of second-generation immigrants can be well explained by potential crop yield in their parents’ country of origin. Finally, an individual-level analysis is carried out. Based on responses to some questions in an international survey, an individual’s LTO is derived, and then it is confirmed that crop yield in the country of the individual is a significant predictor of it. This analysis is also repeated on a regional (within-country) level. I.e. 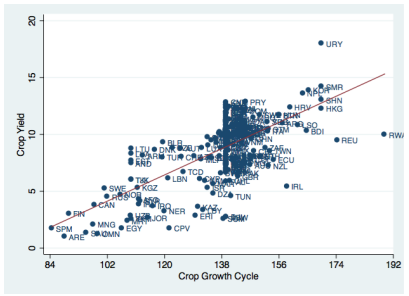 regions within a country with higher crop yield are predicted to have higher LTO. All in all, the theory checks out pretty well. A lot of empirical evidence seems to support it. Therefore, it appears once again that the reasons for varying levels of economic development across the world are at least partially deeply rooted in our past. It seems that long-term orientation – a key driver of growth in the long-run – was significantly determined by the availability of high-yield crops at any given location. These values were then passed down from generation to generation, affecting economic performance in the meantime. This entry was posted in Economic Growth, Evolutionary Economics and tagged agriculture, delayed gratification, growth, history, long-term orientation, patience, time preference. Bookmark the permalink. ← Does the death penalty reduce crime?